Sim, David C., and Boris Repschinski, eds. 2008. Matthew and his Christian Contemporaries. Library of New Testament Studies. Edinburgh: T & T Clark. Darian Lockett (Assistant Professor of New Testament at Biola University) has two publications expected to come out in 2008 that are now available. Lockett, Darian R. 2008. Purity and Worldview in the Epistle of James. The Library of New Testament Studies. London: T & T Clark. Lockett, Darian R. Forthcoming in 2008. 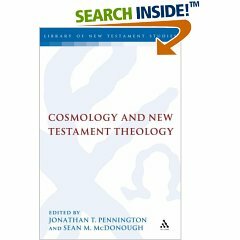 “God and ‘the World’: Cosmology and Theology in the Letter of James.” In Cosmology and New Testament Theology, eds. Jonathan T. Pennington and Sean M. McDonough. London: T&T Clark. Richard Schultz, “Praying Jabez’s Prayer: Turning an Obscure Biblical Narrative into an Miracle-Working Mantra,” Trinity Journal, 24.1 (2003): 113-19. I reproduce my review here. There’s a bit of original exegesis in this that I’ve never received any feedback on, so please send your comments. When Jesus prayed to God, he said, “Not my will but yours be done.” But Bruce Wilkinson turns the good prayer of Jabez into a selfish prayer (“Not your will but mine be done”) that is just the opposite of the example Jesus left us. The prayer of Jabez is short, so maybe that is why the book is so popular: “Oh, that you would bless me and enlarge my territory! Let your hand be with me, and keep me from harm so that I will be free from pain.” Most people don’t have any more time for God than what can be uttered in two quick pleas as they brush their teeth. 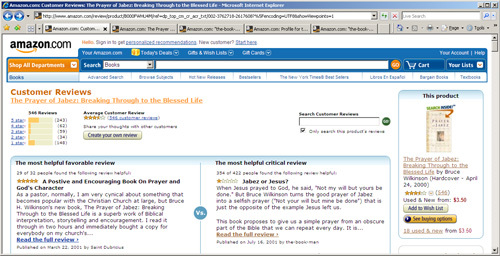 Or, maybe it has become such a top seller because Wilkinson makes such a big deal about the fact that God will grant our prayers just like he granted the request of Jabez. I guess the prayer of Jesus doesn’t make such a good pattern for daily prayer because God didn’t grant his request (please note my sarcasm, since a careful understanding of the Bible shows that God really did answer Jesus’ prayer and I really do think Jesus’ prayer is a much better model to follow). For a man who has tried to teach the church the unity and storyline of the Bible (Wilkinson is founder of Walk Thru the Bible Ministries and co-author of Talk Thru the Bible: A Survey of the Setting and Content of Scripture) I am surprised to see how Wilkinson takes this prayer so out of the context of the Old Testament, and uses it to tell the masses just what they want to hear. My only hope is that he will now use all his popularity and money to tell the secular world what I trust he still really believes is most important. Wilkinson fails to show that Jabez was an Israelite who, when he prayed, asked God for something he knew God had already promised in his covenant with Abraham in Genesis 12:2-3 – “I will make you into a great nation and I will bless you . . . and you will be a blessing . . . and all peoples on earth will be blessed through you.” Jabez knew that God blesses people in order that they be a blessing to others. Ultimately, God blessed all peoples through Abraham’s descendant, Jesus. It’s too bad that Wilkinson’s book isn’t about how we can bless others with the blessings we have received from Jesus. The real prayer of Jabez should also be understood in light of Exodus 34:23-24 – “Three times a year all your men are to appear before the Sovereign LORD, the God of Israel. I will drive out nations before you and enlarge your territory, and no one will covet your land when you go up three times each year to appear before the LORD your God.” When Jabez asked God to enlarge his territory, he was basically asking God to give him the freedom to leave his land in order to worship God without having to worry about those who might covet and steal his land, crops, and possessions. I don’t think most of us in America have to worry about our land when we go to church on Sunday. It’s too bad Wilkinson’s book isn’t about asking God to give us the grace to worship him freely and without the hindrance of all our worries. Rather than teaching us to trust God amidst our worries, Wilkinson’s book teaches people to do what we already do too easily – to trust in ourselves and in the “blessings” that we think we need. If you want a prayer to live by, why not pray the prayer that Jesus instructed his followers to pray: “Our Father in heaven, hallowed be your name, your kingdom come, your will be done on earth as it is in heaven. Give us today our daily bread. Forgive us our debts, as we also have forgiven our debtors. And lead us not into temptation, but deliver us from the evil one.” We would learn and grow and experience so much more of God’s blessings if we prayed this every day. For dealing with pain, why not pray the prayer that Jesus prayed before he went to the cross: “Father, if you are willing, take this cup from me. But not my will but yours be done.” God knows so much better than we do what blessings we really need. When we pray to be free from financial hardship or physical suffering, perhaps God wants to use those things to lead us to a much more lasting blessing. It’s true that God promises to grant believers in Jesus whatever they ask in Jesus’ name. But note the requirement that we pray according to God’s will. Thank God that he doesn’t grant our every request! If you want a book on prayer, particularly the Lord’s prayer, I would rather recommend C. S. Lewis’s Letters to Malcolm: Chiefly on Prayer. If you want a book on dealing with pain, I recommend Tim Hansel’s You Gotta Keep Dancin’, or C. S. Lewis’s The Problem of Pain, or C. S. Lewis’s A Grief Observed. If you want a book on God’s desire to bless us, you have got to read John Piper’s Desiring God.